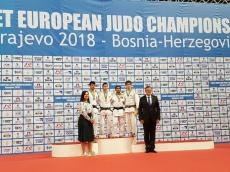 Azerbaijani fighters have grabbed two medals on the first day of the Cadet European Judo Championships in Sarajevo, Bosnia and Herzegovina. Matin Rzazade claimed a silver medal in the men’s 60g weight category, while Miragha Hajiyev took bronze in the men`s 50kg division. The tournament brings together 457 judo fighters from 42 countries.